Good morning, everyone! I hope you had a wonderful weekend! I have lots of fun things planned for the week ahead and I’m hoping you will keep stopping by. Today I’d like to share a simple Valentine’s Day card using goodies from Hero Arts. This is more of a traditional card and it is indeed very easy to make. For this project I started by die cutting a heart using a Renaissance Heart Hero Arts die (there are multiple shops linked at the bottom of this post in the supplies section) out of Floral Layering papers from Hero Arts. 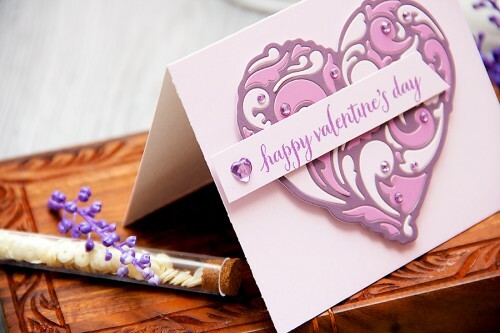 There are 3 shades of purple or lilac in a pack and I die cut a heart out of each color (I actually made 3 cards, but took a photo of just one as they are pretty much the same). I used the main heart in one color and filled in the little die cut gaps using two other colors (and using die cut pieces from the two other hearts). So for this project I used the darkest shade for the main heart and filled it in using the lighter colors. All of these pieces were adhered onto a piece of white cardstock which I hand cut to be used as a base. 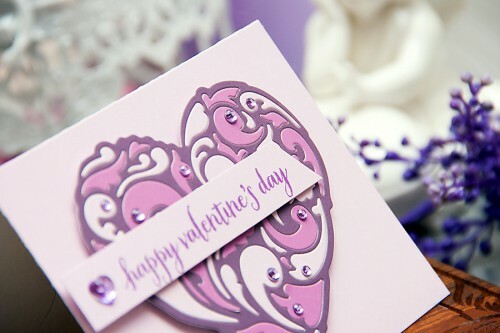 The die cut heart was next adhered onto a light purple card base using foam adhesive to create a bit of dimension. For the sentiment I used a Happy Valentine’s Day one with a cute handwritten font, I stamped is using a Grape Juice ink pad. To finish my card I embellished it with a few purple gems. Beautiful ~ love that you could get three cards using all the pieces! thank you, Di! Really glad you liked them! 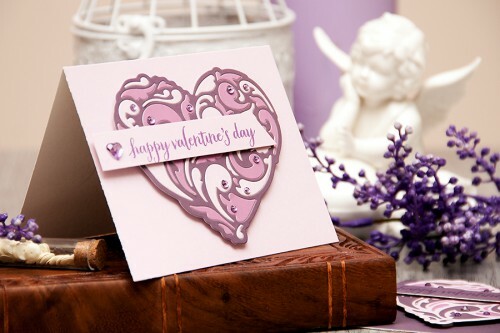 Love the shaded heart in purple hues, great piecing!